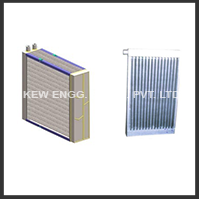 Stenter Machine Radiators Manufacturer, Stenter Machines Manufacturer. We have been manufacturing, exporting and supplying Radiators for Textile Stenter Machine. Our rich experience in manufacturing Radiators for Stenter Machine like Round Tube Radiators, Round Tube Radiators, Thermic Fluid Radiator with features of high quality, longer durability and meeting client’s requirement. All type of Web Guiding System, web aligner and line guide system.